The woodland vole, also known as the pine vole, is common throughout the eastern United States, extending north into southern Ontario and Quebec and south into northern Florida. Southeastern Minnesota represents the northwestern limit of the species' distribution. In the center of its range the woodland vole is locally common, even abundant enough to be considered a pest in orchards (Smolen 1981). However, in Minnesota, Wisconsin, and northern Iowa, it has never been recorded as abundant. The woodland vole has been documented at only four locations in Minnesota, two in Houston County and two in Winona County. It was last recorded in the state in 1993. Due to its semi-fossorial habits, the woodland vole is often difficult to detect and is not readily trapped. Based upon the lack of records for this species and its restricted distribution in Minnesota, the woodland vole was identified as a species of special concern in 1984. Woodland voles have soft, dense fur that is chestnut brown or slightly reddish on the back and buff or grayish underneath. They are smaller than other Microtus species and are adapted to a semi-fossorial life with small eyes and ears, well-developed whiskers, large fore-claws, short, mole-like pelage, and a short tail. Typical adults are 118-123 mm (4.6-4.8 in.) in length, with a tail length of 21 mm (0.8 in.). Average adult weights are 20 g (0.7 oz.) for males and 22 g (0.8 oz.) for females. Woodland voles can be distinguished from other short-tailed voles found in Minnesota, such as bog lemmings (Synaptomys spp. ), by pelage and dental characteristics and by the different habitats in which they occur. 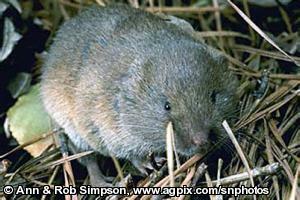 Woodland voles can be found in many habitats, from closed-canopy hardwood forests to grasslands with shrub overgrowth. Their preferred microhabitat includes loose, well-drained soil with a thick layer of litter and vegetation. The most recent occurrences of woodland voles from southeastern Minnesota and northeastern Iowa were from mesic hardwood forest habitats, however earlier records in Winona County were from apple orchards. Woodland voles spend the majority of their time in burrows and sub-surface runways. Their home range is limited to this system of burrows and runways and is estimated to be 0.1 ha (0.25 ac.) (Smolen 1981). A single burrow system may serve as home for a social group of adults, male and female, and their young. Nests are constructed of grass and leaves inside the burrow or under a tree or log (Hazard 1982; Smolen 1981). Females produce 1-4 litters per year with 1-6 pups per litter. Gestation lasts 20-24 days and the pups are weaned between 17-20 days after birth (Smolen 1981). The diet of woodland voles varies seasonally, with grass stems and roots eaten in the summer, fruits and seeds preferred in the fall, and tree roots, bark, and previously cached food eaten in winter. Woodland voles are active year-round and throughout the day and night. Recent records for woodland voles in southeastern Minnesota and northeastern Iowa have been from mesic hardwood forest habitats, where the soil has not been compacted by grazing or heavy machinery. Management of the apple orchards, where earlier records were obtained, has changed to include frequent mowing between the trees and application of pesticides. This alteration in land practices may affect the suitability of this habitat for woodland voles. Efforts to further define the range of woodland voles in Minnesota should be continued, and where the species is found, local populations should be monitored and protected. A survey of small mammal species reaching their distributional limits in southern and western Minnesota, conducted in 1982, failed to document any locations of woodland voles (Birney 1983). In 1993, the Minnesota Biological Survey documented woodland voles from two locations in southeastern Minnesota. In both cases, the habitat was lowland hardwood forest adjacent to maple-basswood forests and both sites were under state management. Attempts to document woodland voles in commercial apple orchards, where they were previously documented, were unsuccessful. Birney, E. C. 1983. Status of small mammal species reaching distributional limits in southern and western Minnesota. Final report submitted to the Nongame Wildlife Program, Minnesota Department of Natural Resources. Unpaged. Smolen, M. J. 1981. Microtus pinetorum. Mammalian Species 147:1-7.